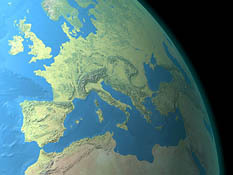 Free  Natural Earth derives from multiple data sources, all of which are in the public domain. Use it however you wish. High-resolution  The dimensions of Natural Earth in pixels measure 32,400 wide x 16,200 high. Each pixel on the map represents 1.24 km (0.77mi) on the surface of Earth at 40-arc-second resolution. It is suitable for small-scale mapping of Earth's entirety or of continent-sized areas. Map projection  The map extends from 180 degrees West to 180 degrees East longitude and 90 degrees North to 90 degrees South latitude and uses the plate carrée (geographic) projection, the standard format for delivering raster geodata. A World File (.tfw) and projection and datum information accompany all downloads of Natural Earth. You can easily georeference and then reproject Natural Earth, or cropped sections of it, to any other map projection. Shaded relief  Natural Earth is available with or without embedded shaded relief. (left) Southern California with landcover only. (right) Landcover merged with shaded relief. Water layer  Download Natural Earth with or without embedded water bodies and drainages. The water layer also is available as a separate download. Use the provided water layer or swap in one of your own. Shoreline buffering  Landcover data extend offshore for 20 kilometers into oceans and seas. Interpolated landcover data also fill in the voids behind all lakes, including the Aral Sea. You can use Natural Earth with highly generalized coastlines obtained from other sources and still maintain leak-proof land/water registration. 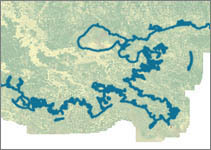 Mississippi buffering: landcover pixels extending into the Gulf of Mexico. Natural color  Based on the palette developed by the late Hal Shelton of the USGS, map colors mimic those found in the natural world, making it easier for readers to identify environmental zoneseven without a legend. The light background colors are receptive for displaying type, linework, and other map elements. Extras  Accessorize Natural Earth with supplemental overlays, including urban areas, international boundaries, Antarctic ice shelves, and arctic multi-year pack ice. Supplemental urban landcover (shown in purple) for Denver, Colorado. 3D applications  Use Natural Earth with a Digital Elevation Model (DEM) to create three-dimensional landscapes or wrap it onto a sphere for viewing Earth from outerspace. Natural Earth applied to a 3D sphere. Click here to see larger version.